Home » What is Canine Hydrotherapy? Hydrotherapy for dogs simply put, is the usage of water for the treatment of injury or illness to dogs. Water makes the body float, so when submerged, the weight of a dog’s body is fully supported. This means the dog is not fighting any gravity. The buoyancy of water also reduces the stress on joints, which creates a much safer environment for recovery and regeneration. Controlled and assisted swimming allows a dog’s muscles to be exercised and stimulated without the stress that comes with a land-based exercise. This is why underwater treadmills are not as effective as pure natural swimming. 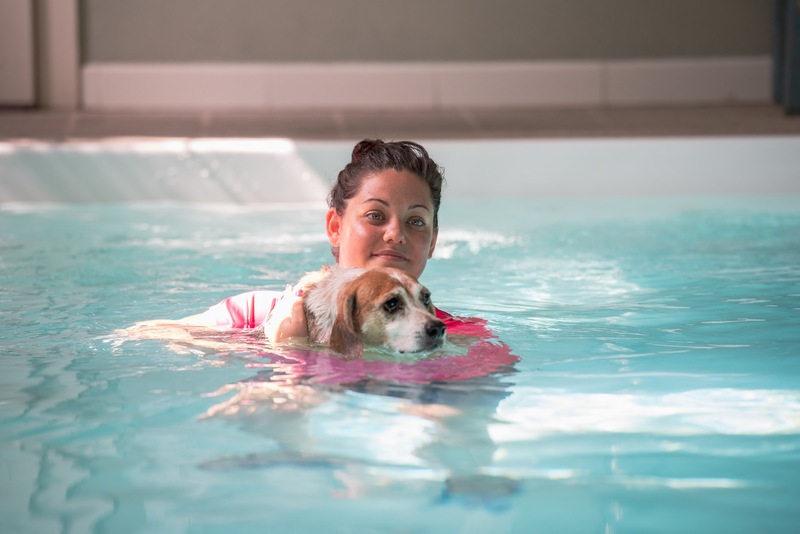 Hydrotherapy offers a dog a relaxed, enjoyable and therapeutic workout. What Types of Dogs need Hydrotherapy? Hydrotherapy is beneficial for any dog needing to achieve an overall state of well-being. Assisted swimming can create improved circulation, flexibility, muscle strength, cardiorespiratory endurance, and agility. Dogs who are recovering from an injury, suffer degenerative joint disease and who have been paralyzed are also great candidates for the water. Aqua therapy (which is the same as Hydrotherapy or Water Therapy) assists dogs suffering from fractures, hip dysplasia, the amputation of a limb, and neurological disorders. Lastly, the water is especially beneficial for dogs who suffer from arthritis due to the aging process; The warmth of the water reduces the inflammation that causes pain. Concurrently, hydrotherapy stimulates, strengthens and relaxes the body. It improves balance, coordination, and ups overall energy levels, all while reducing pain and stress. Increase lymph drainage, rid the body of toxins and improve the immune system. Muscular.When moving around in water, a dog’s body starts to relax therefore easing pain, stiffness, inflammation and spasms. Circulatory. The warmth of the water associated with hydrotherapy raises a dog’s body temperature allowing blood vessels to dilate. When these vessels enlarge, a dog’s circulation increases, creating detoxification and oxygen to move along their cells carrying away waste and toxins. The weightlessness of the water also counters the effects of gravity which increases blood volume to the extremities. Lymphatic. Soft tissue is compressed which increases lymph movement, drainage and decreases inflammation to improve the immune system. Respiratory. Water expands the depth of respiration by putting pressure on the lungs, providing necessary oxygen to the body and getting rid of carbon dioxide. Nervous. Water decreases stress and soothes the nervous system by stimulating sensation channels. Integumentary. This system is composed of an animals skin and coat which is the largest part of the body. Water enlarges circulation which assists a dog’s skin and coat condition by also stimulating touch receptors. Digestive/Urinary/Reproductive. Water increases blood flow through the kidney’s getting rid of toxins and removing waste. It also regulates electrolytes in the body providing nutrients to a dog’s cells and enhancing hormones needed throughout their bodies. Skeletal. The skeletal system supports the body and protects all internal organs. Water decreases inflammation, increases circulation and enhances a dog’s range of motion by stretching and movement. It is important to know that there is a significant difference between bringing your pup to a certified professional versus having your dog swim in your home pool and calling it therapy. Without proper supervision in the water, dogs recovering from surgery may not have the muscle strength needed to swim correctly and effectively; the appropriate water temperature is also vital for their health and recovery. Bacteria and chemicals from a pool can cause infection in a recent incision and may harm their skin health. Lastly, if your dog is not properly stabilized and guided in the water they may be putting pressure on the wrong area needed for recovery and create the risk of doing more harm than good. Bottom line, hydrotherapy works for dogs. It is not a fad and many dog owners have reasons to be grateful for it. It is a real holistic treatment that creates real lasting results.